Venezuela elections: Nicolás Maduro's Socialist Party loses big. 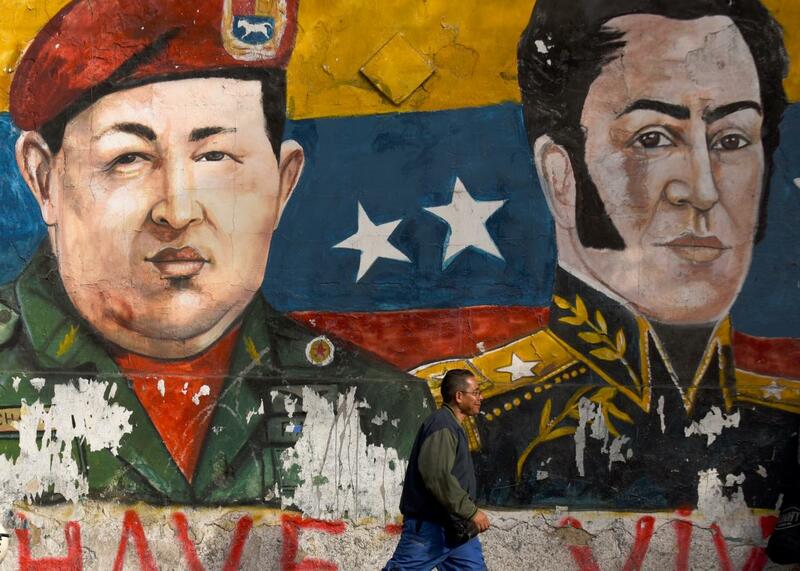 A man walks by graffiti depicting late Venezuelan president Hugo Chavez and 19th-century hero Simón Bolívar on a wall near a polling station in Caracas during Venezuela’s legislative election, on Dec. 6, 2015. Venezuela ended 17 years of authoritarian socialist rule on Sunday, as the opposition won a majority of the 167 parliamentary seats up for grabs during historic elections. Almost 85 percent of Venezuelans are dissatisfied with their country’s situation, according to a Pew Research Center poll, as staples like milk, bread, and toilet paper are increasingly scarce and waiting in multiple-hour lines for these goods has been a fact of everyday life for years. Looting is on the rise, as is violent crime, now at a historic high in the South American country, with the second highest peacetime murder rate in the world after Honduras and 98 percent of crimes going unpunished. In 2014 tens of thousands of Venezuelans voiced their discontent in massive street protests that left at least 43 dead, dozens injured, and resulted in more than 3,000 arrests and millions of dollars in property damage. Opposition leader Leopoldo López was jailed at the time, and was recently sentenced to 14 more years in jail for inciting violence connected to the protests. Though some irregularities were reported, like armed military entering voting precincts, drones flying above, and people eating their proof of vote slips so electronic votes and physical votes wouldn’t match, Maduro accepted the results, acknowledging a 75 percent voter turnout. Maduro remains president for now. But the fact that MUD won a majority of votes gives the opposition the opportunity to gain votes for a referendum on Maduro’s presidency, replace the vice president and ministers, or at the very least, block PSUV legislation. The MUD is also expected to pass an amnesty law to release political prisoners, who once freed would be able to run for office. If the opposition garners a supermajority in the parliament, 111 out of 167 seats, they can then also replace judges and prosecutors, posing an even larger threat to Maduro’s leftist rule. Their victory is part of a larger shift toward center-right politics in Latin America, as Argentina’s neoliberal candidate Mauricio Macri won the presidency there last month. Correction, Dec. 7, 2015: This post originally misidentified the winner of last month’s Argentinian presidential election as Antonio Macri. It was Mauricio Macri who won.